Last week, I had the pleasure of speaking at Denver's Java User Group Meetup about JHipster. 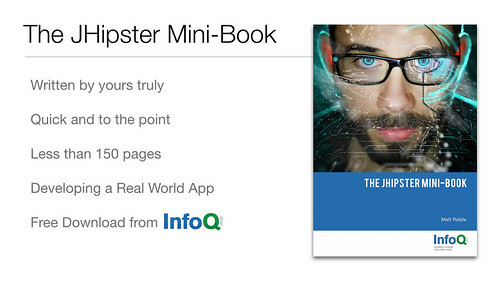 I've been a big fan of JHipster ever since I started using it last fall. I developed a quick prototype for a client and wrote about solving some issues I had with it on OS X. I like the project because it encapsulates the primary open source tools I've been using for the last couple of years: Spring Boot, AngularJS and Bootstrap. I also wrote about its 2.0 release on InfoQ in January.